SWF Flash File - The SWF file is the 'controller' file and includes the skin and player functionality. This is the file you add to your webpage. XML File - The XML File acts like a 'Playlist', telling the SWF File what Video (FLV) or Audio (MP3) Files it should play, and in what order. FLV or MP3 Files - These are the actual media files that are loaded and played back by the player. A minimum of one is obviously required, but you can include as many as you wish. 1. Prepare Media Files - FLV (Video)/MP3 (Audio). If you need to convert your video clips from their original formats (.mov, Mpeg, .wmv, etc) to FLV, there's plenty of software to help you do this. 2. Reference Media Files in XML File. 3. 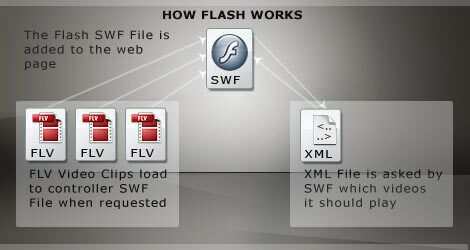 Add the Flash SWF File to your webpage. The standard method for adding Flash to a webpage is to use the HTML 'OBJECT' Tag. We provide a code snippet that you can cut'n'paste to your webpage. A full explanation will be included with your download. 4. Upload all files to the Web.